The box in the upper right says "Danjūrō" (團十郎). The actor in the role of Shibaraku is Kawarazaki Gonjūrō I. 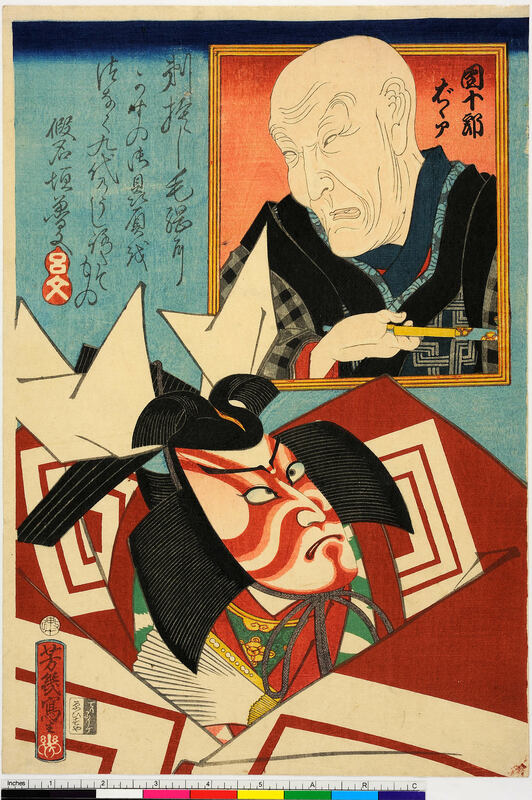 The actor Ichikawa Danjūrō IX held the name of Kawarazaki Gonjūrō I from the 9th lunar month of 1852 to the 2nd lunar month of 1869. This actor as Shibaraku looks back to the founder of his acting group, Ichikawa Danjūrō I (1660-1704). 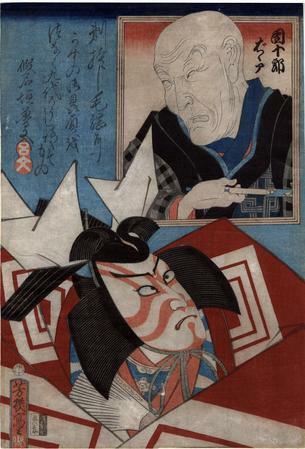 The text by Robun Kanagaki (仮名垣魯文 - 1825-1894) in the blue field in the upper left reads: 剃捨し毛綱にかすの御贔屓をつなく九代のうしろたてもの 仮名垣魯文. Kawarazaki Gonjūrō I was the brother of Ichikawa Danjūrō VIII who died in 1854. Gonjūrō did not adopt the Danjūrō name until twenty years later. The family crest of three nested squares - mimasu or sanshō 三升 - appears on the costume of Shibaraku. Likewise, the tribute portrait in the inset is found within a three boxed frame. This theme of three sqaured boxes appears one more time in an interlocked pattern on the robe of the elderly Danjūrō. All of this is subtle but intentional. This bust-portrait depicts the actor Kawarazaki Gonjuro I (Danjuro IX, 1838-1903) in the Shibaraku role, juxtaposed with an inset panel labeled Danjuro babaa, depicting his father, Ichikawa Danjuro VII (1791-1859) who had passed away the previous year. Presenting Gonjuro in the Shibaraku costume, a role closely associated with the Danjuro name, with his father looking on from above, implies that Gonjuro will be adopting the Danjuro name soon, and the poem by Kanagaki Robun makes reference to the 9th, which would be his place in the line. Although his older brother had already taken the name in in 1832 at the young age of only 8, Danjuro VIII (1823-1854) committed suicide six years earlier, predeceasing his father by five years. It was several more years before Gonjuro finally adopted the Danjuro name in 1874.